Home » executive-skills » gifted » parenting » Why Don't Smart Kids Act Smart? Did you know that self-control is a better predictor of future success that IQ? Why? 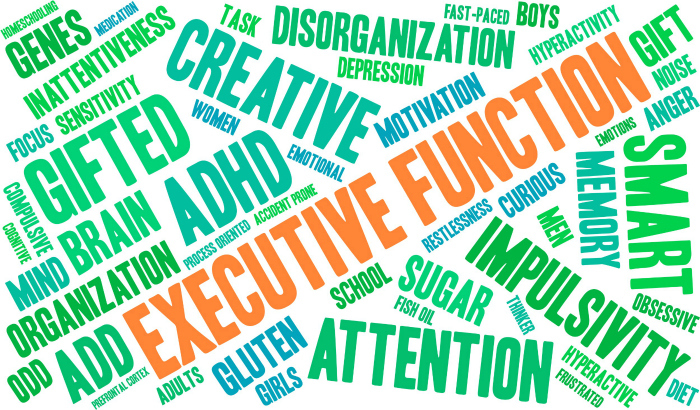 Because self-control is part of that magic set of skills that we call executive function. I find the topic of executive function infinitely fascinating. One article I read aptly compared executive function skills to the fuel of a car where intelligence is its engine. Without a fuel intelligence is not very useful. The engine can be powerful, but it's sustained attention, goal-directed persistence, and self-control that helps us get where we want to go. I wrote about executive function before on my blog and in that post I shared this chart from Harvard Center on the Developing Child showing how executive function matures over time. 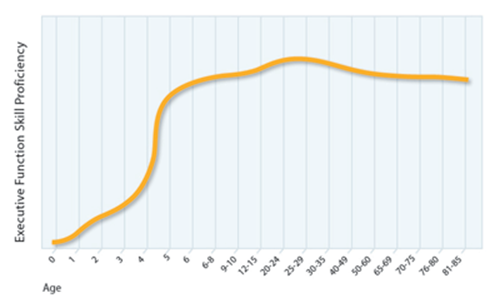 You can see from this chart that one cannot expect young children to have the same executive skills as adolescents. But one might wonder if you we expect children with high IQ to have executive skills equal to their IQ age. Alas, this is not how it works. In fact, many people with high IQ have pronounced deficiencies with executive skills perpetuating "an absent-minded professor" stereotype. Many gifted children are very asynchronous between their intellectual abilities and their everyday behavior, because their executive skills might actually lag behind their chronological age rather than the other way around. 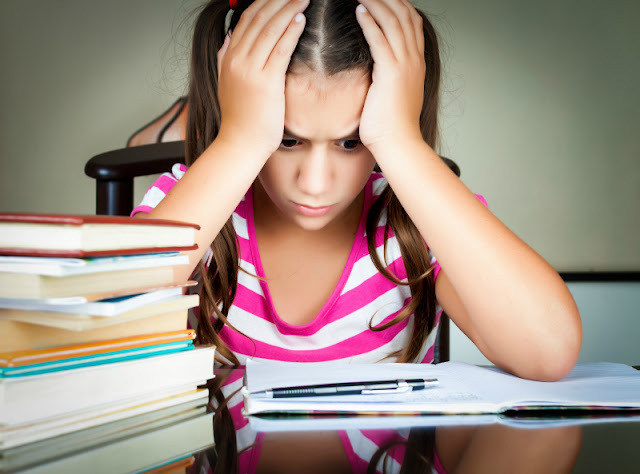 Sometimes I hear parents of gifted kids making a lot of excuses for their child "below age" emotional outbursts or underachievement by saying that they are too bored to do activities designed for their age. But I've spent many hours volunteering in my daughter school and saw that many bright kids are not exactly bored, but they are certainly "scattered". They have problems with planning their time and initiating tasks, sustaining attention and persisting with difficult tasks. So can we do something to help our children develop their executive skills? Harvard Center on the Developing Child has some great activities promoting executive skills for every age starting with children as young as 6 months old and going all the way up to adolescence. Speaking of adolescence, this is the time where executive skills are somewhat in turmoil. According to the latest research, brain is undergoing a major "reconstruction" during teenage years. Let's add to this hormonal changes of puberty, and we have "teenage effect" with increased risk-taking behavior. Even though Smarty is not yet reached her teenage years, we talk sometimes about this phase. I wish I knew more at the time of my own adolescence about how my brain and my body works. I didn't end up doing anything particularly stupid, but not because I had great self-control but because opportunity did not present itself. Just as with emotional intelligence, developing executive skills is a journey, with its ups and downs. There are times when Smarty amazes us with her ability to focus on a difficult test or tackle a complex project. Yet, she does struggle with organizing her room or her backpack and with procrastination. The key here is to support our kids while they are learning from their mistakes and celebrate their accomplishments when they demonstrate the skills. Book Smart but Scattered has a lot of great tips on how to do just that. What else did we do to help our child develop executive skills? We established routines to help her do certain things (like, say, brushing her teeth) automatically. We use checklists to define what a "good job" looks like. We signed her up for martial arts - any sport is good, but martial arts require students to consistently demonstrate focus and self-awareness to progress. We also use "task lists" to help her manage her time effectively. We acknowledge her struggles but try to focus more on times when she does well. How do you help your children develop executive skills? 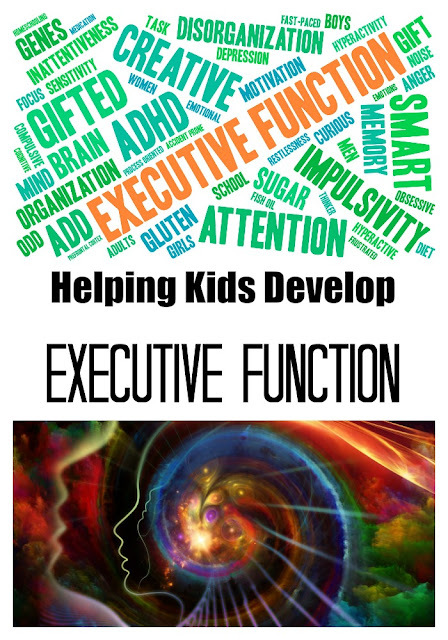 Join other gifted bloggers discussing emotional intelligence for gifted learners by checking out Executive Function Blog Hop at Hoagies Gifted. Follow Hoagies Gifted on Facebook. My kids actually have pretty good executive function skills. Their challenge is coping with shyness/introversion. Good summary and explanation about how these skills can be lagging behind for gifted children. Thanks! Very interesting post! This definitely applies to my now 19 year old, who we lovingly call the absent -minded professor! Every time you mention Smart But Scattered it reminds me I want to try it. Heading over to Barnes and Noble to see if it's on Nook.